I agree with the first 2 ID's. The boulder looks like it's from Koroit in Queensland, Oz. 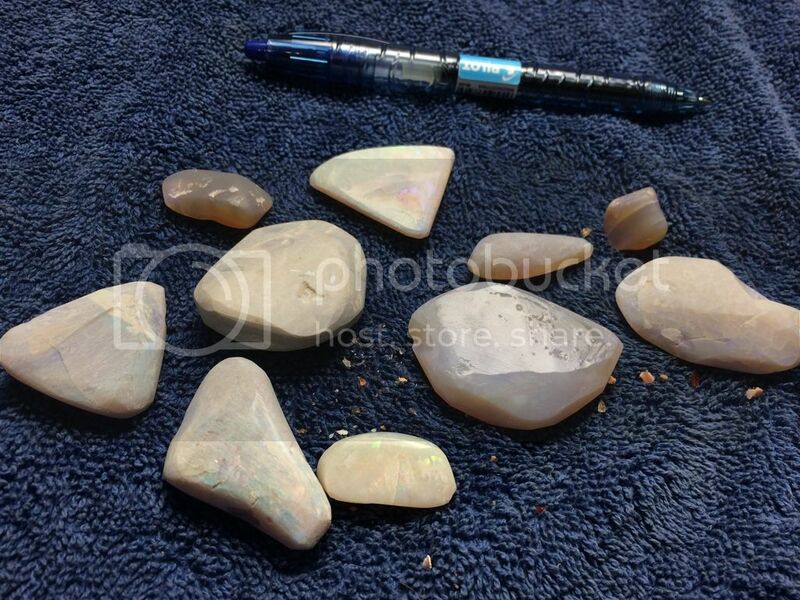 #2- Australian light opal, could be from any one of several fields: Coober Pedy, White Cliffs, Grawin, etc. Most likely Coober I think. 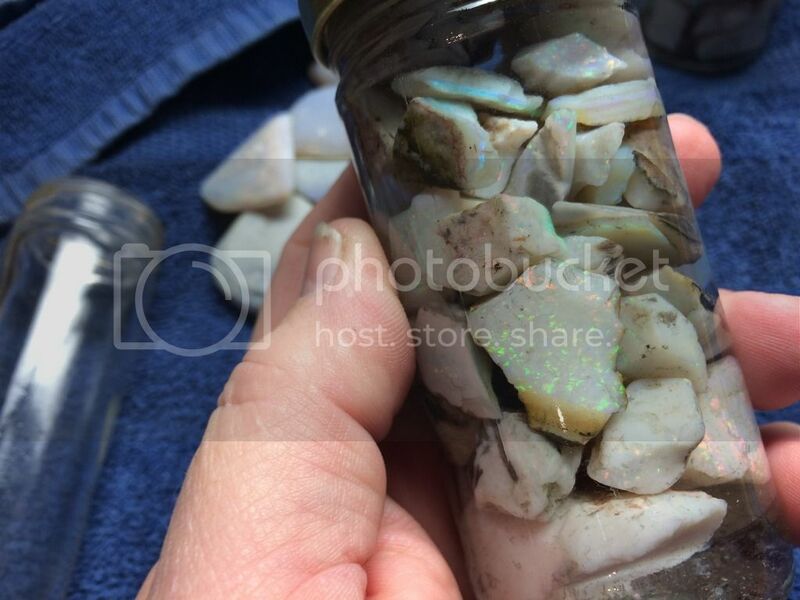 #3 - Spencer opal from Idaho. #4 - Probably Coober Pedy, Oz. Looks like it's been tumbled. #5 - More Spencer opal. Great batch - you'll have many hours of pleasant cutting ahead. Not sure on all of them, but I completely agree with gemfeller on #2 and #3/#5. Hard to say from a single photo like that, but #1 could be some top grade Honduran. There were small amounts that had more than the scattered pinfire. The characteristics of the black potch (or matrix - if Honduran) would help to figure that one out. 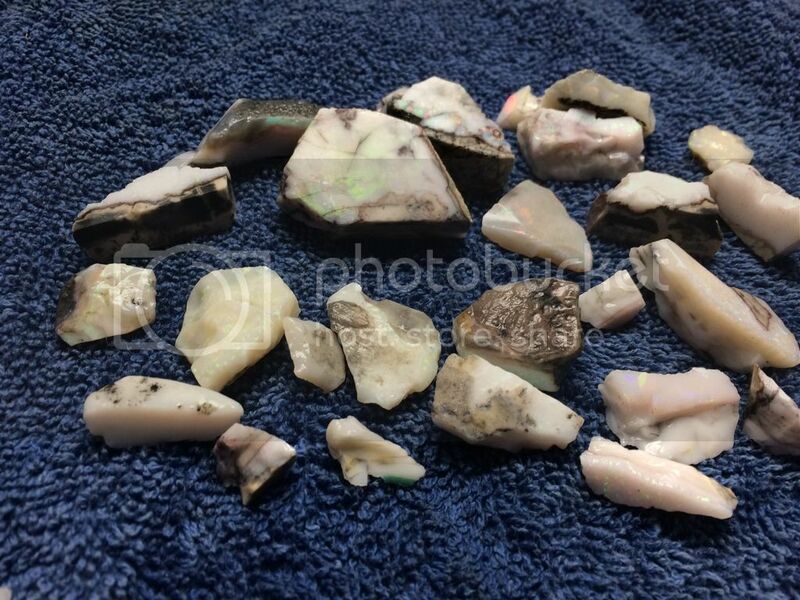 #4 could also be some "muddy" Lightning Ridge rough. Some similarities there to some we have. I'll second the nice buy statement, for sure. Looks like you have some Spencer thick enough to cut small solids. Those are pretty hard to come by for most of us. Gemfeller is spot on (as always). I would venture to guess that #1 is probably also Honduran. If you compare the known Hondurans against that one and they are similar, that's probably what it is. 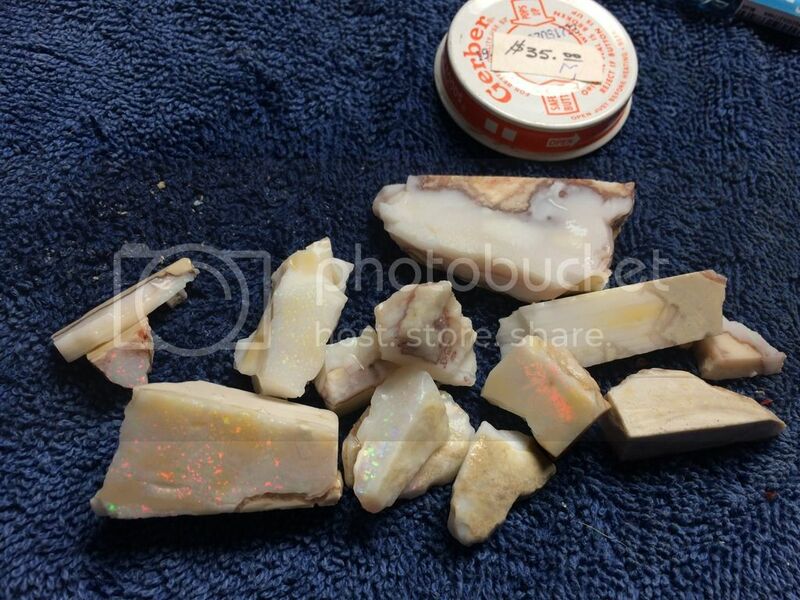 Be aware that boulder opal is extremely messy to cut and stains everything it touches, so wear crappy clothes! The more I mull it I think Vince is right about #4. 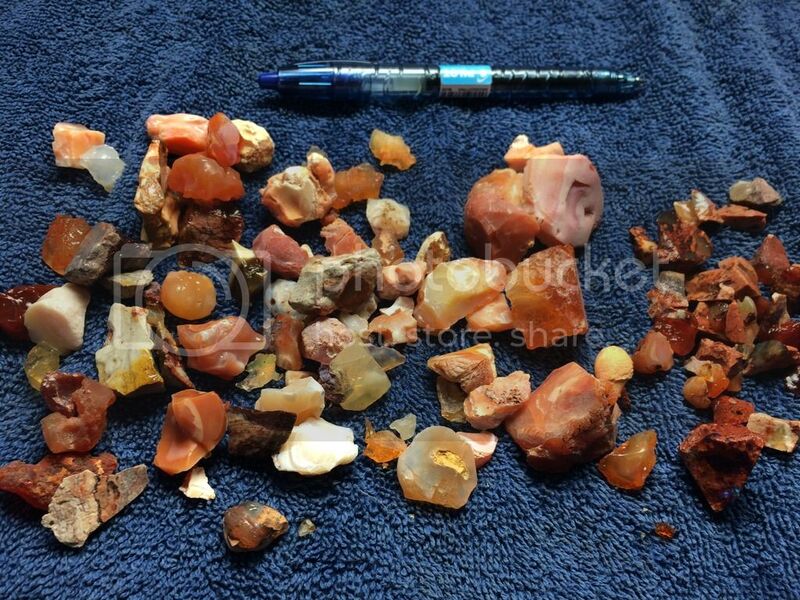 Those "tumbled" pieces look like Lightning Ridge nobbies that have been through the agitator process. 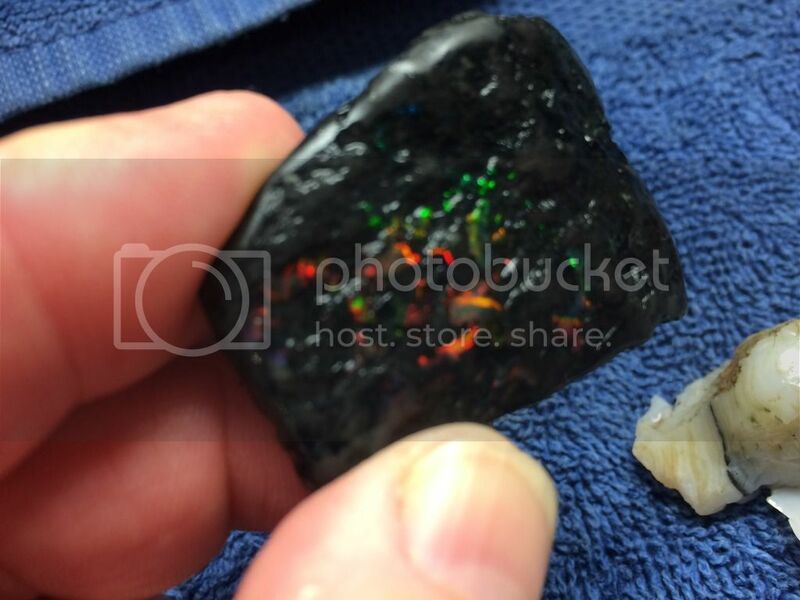 Unfortunately not all nobbies yield black opal but those could contain some nice color with careful grinding. Robin, you remember when you and I split that parcel of rough from 23mile field along with the Turkey ridge (got it from the guy in Montana)? 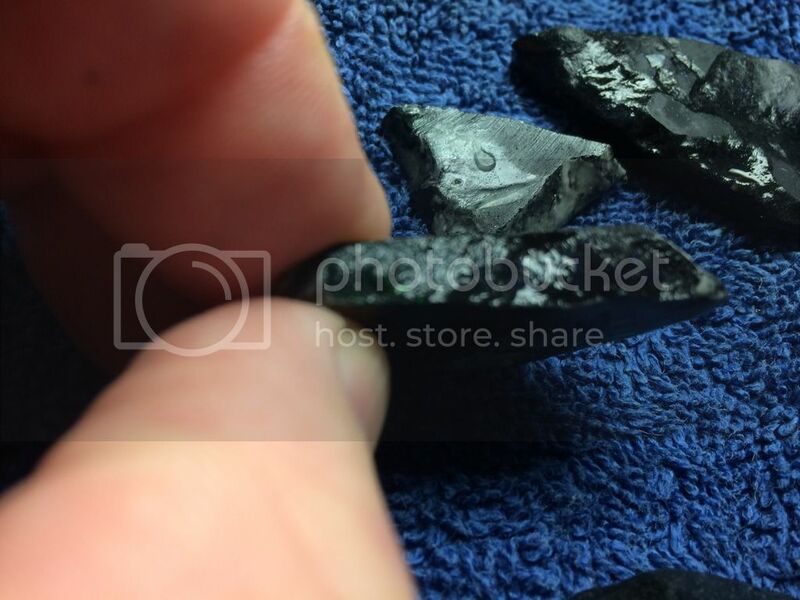 While I agree that #4 might be tumbled LR nobby, there are a couple stones there that look just like that stuff we got from that parcel (not sure what they call that place now, back then he stated it was called 23mile field). I remember the bars being really smooth with semi-transparent/cloudy potch. The top right corner piece in that set reminds me a lot of this. Just some thoughts. The only thing that bugs me about them overall is the fracture patterns on some of them. I know it's been a while since I've handled LR and CP rough, but the fractures on some of those pieces don't seem right for those areas (could be totally wrong though). The more I look at #4, the more I'm convinced Vince is right. I didn't study #4 very well the first time I looked at it. Going back and looking again, I can see the clay/mud pits in those stones. That just normally doesn't happen except in nobbies -- usually right in the middle of great color (kind of like Chinese Writing, Jon). 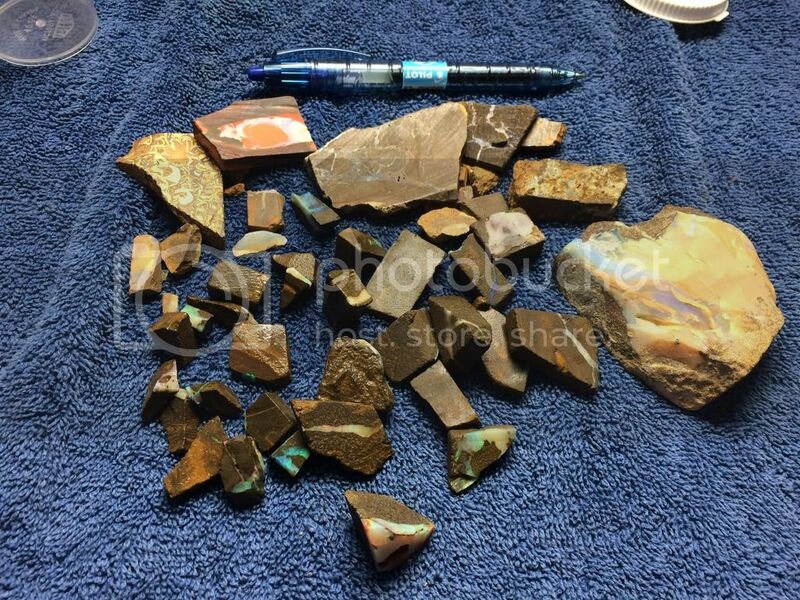 #1 Indonesian banten wood fossil Opal? Page created in 0.13 seconds with 45 queries.